I’m not an outside sweatshirt-wearing kinda girl… but you better believe that this puppy will be worn while bumming around my house! I LOVE IT! Everyday I’m Hustlin — wha what?!!!! This pretty much sums up my life. When most people think of hustlers– they think street corners which obviously doesn’t relate to me. I do most of my work on my couch. Wait. That didn’t come out right. I do most of my work on my laptop. How about that? 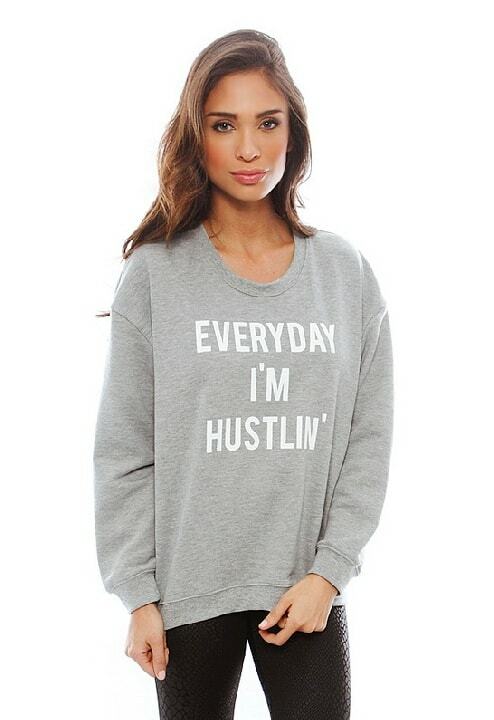 The Hustlin’ Sweatshirt in Grey Marle retails for $69. Previous Post: « Carvel Announces New Ice Cream Flavor – Nutella!!! !